We were a little pressed for time today because we really wanted to do some last minute shopping in Fort William before heading out to Steall Falls at the foot of Ben Nevis and then driving a few hours on to Stirling where we wanted to go see Stirling Castle. We have been looking for something specific since we saw it in Edinburgh and figured we could get it pretty much anywhere with so many tourist shops around. But we were wrong, it was almost impossible to get what we were looking for (a brooch to go with my tartan stole) but the final store we decided to visit had what I needed; a beautiful brooch that matched the colours of my tartan stole to keep it in place. Yes, and the local didn’t really mention the second parking lot either. I really don’t think complaining about the extra hours walk would do us any good so on we went onto the path leading to Steall Fall. 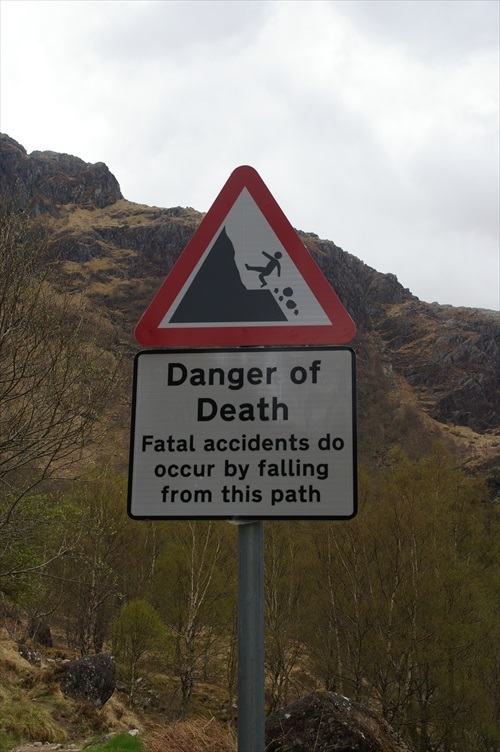 They had a lovely sign up to warn us about the dangerous path ahead and that it could be lethal but that didn’t scare us away. Keeping an eye on the time we decided to walk until we could see the waterfall in the distance, take some photos and turn around, as by now we had another hour and twenty minutes to walk back to our car and Stirling was a few hours drive away too. As much as I regret not walking all the way up to Steall Falls it was a beautiful hike and I got to see some amazing views and climbed a few waterfalls along the way so it was worth it. 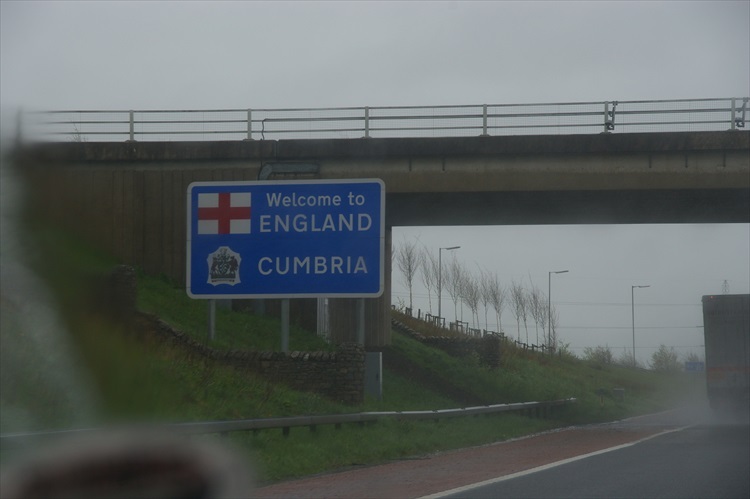 The drive to Stirling itself was pretty uneventful apart from all the beautiful views, all around Scotland the views are amazing it doesn’t matter where you are. We could see Stirling Castle arise in the distance and before we knew it we drove into Stirling. Stirling Castle is fantastic, it really is a great place to visit with kids too! They have games all throughout the castle for children to play and employees dressed up in period clothing doing tours and giving out information in different parts of the castle. I think Stirling Castle is the best castle I’ve seen on this journey. It’s a full castle not just a ruin (although they were awesome too) and it was very pretty, well kept and throughout you could find a lot of information about the castle, its history and battles it witnessed. Stirling itself is pretty picturesque but we didn’t get to see much, it was getting a little late and we still had to find our hotel. We tried walking into town but some funny person apparently switched some signs and we were directed out of town instead. Luckily our hotel wasn’t too far away and easy to find. But to my surprise when I went to check us in, the door was locked. After looking around for a bit I noticed a letter next to the door directed to me, stating it was unfortunate they couldn’t put us up for the night and a phone number of a bed and breakfast in the area that was able to give us a room for the night. I called the number and got directions to the bed and breakfast, which was a mere 5 minutes away. I have to admit the bed and breakfast was a great place, the owners are very friendly, the rooms were big and clean and the bathroom was perfect too. It was a really homey feeling to be there, and not being able to stay in our booked hotel but in this quiet bed and breakfast instead wasn’t a bad thing after all. I have to say thumbs up to booking.com who really helped me out with confirmations and checking up to see if everything was in order for us. And of course to the owners of the B & B for being able to put us up on such short notice. I think today would be the route through the area most people think about when they hear Scotland, the area around Loch Ness. 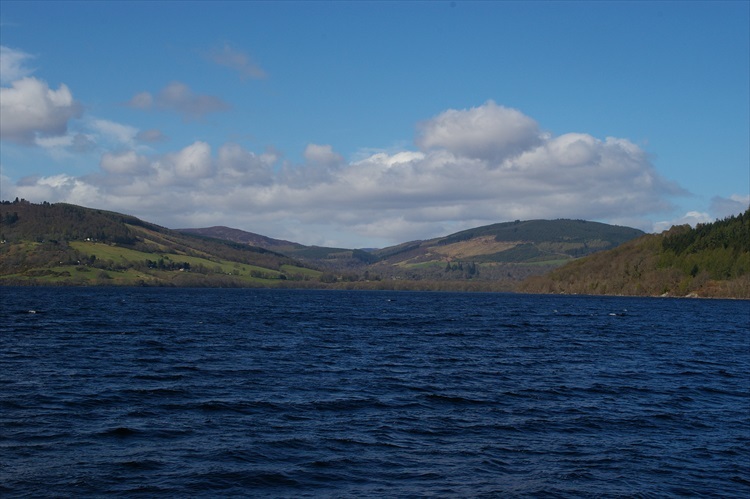 The largest fresh water lake in the UK is obviously known for its scary inhabitant Nessie. At 10 AM we got on a boat to do an hour tour of the lake. It was another sunny day up in the highland but around the lake it was very windy so coats weren’t a luxury. The view from the lake is breathtaking, the mountains surrounding the lake are overgrown with trees and small streams run down to the lake in little waterfalls. Castle Urquhart looks out over the lake, and even though it’s in ruins now still looks like a strong fortification. The castle itself is in ruins after it was purposely set on fire by the last owners. It has had many owners in its past and it was attacked many times to either seize it or loot it. The road to Fort William took us past the whole lake shore of Loch Ness and beautiful view points along the way. It takes a little walking up to the viewpoints after parking your car but it was worth it. We got a good look at Cherry Island, the only island (although it’s man made) in Loch Ness. It is namen for all the cherrytrees that (apparently) grow there. There are many lochs in this area, we drove past Loch Lochy and our hotel is located on the shore of Loch Linnhe right outside Fort William. After check in and before going for dinner we found out directions to Steall Fall at the bottom of Ben Nevis, which we’ll visit tomorrow. As Harry Potter fans we had to see the bridge the Hogwarts steam train drives over and the lake they fly over on the big bird in the movies. Both are located here very close to each other (at opposite sides of the road). The lake is Loch Shiel and it’s even more beautiful than in the film. It’s a big climb up to the view point with large boulders sticking out everywhere but it’s doable and a must-do when you’re there. After visiting the bridge and the lake it was time for dinner, we ended up at a local pub in Fort William for an ok meal (wouldn’t recommend it to eat there). Tomorrow is our last full day here to see things, we are driving up to Stirling before we head back down to Newcastle on Saturday. Time flies but we’ve seen so much it doesn’t feel like a week at all :). We haven’t really done any shopping on this trip yet, and we do want to take some nice souvenirs home. So the first part of our extra day in the Inverness area today was spend walking around Inverness town and doing a little shopping. We also visited a kilt maker; Fraser’s. It’s very nice to see how kilts are made, I had no idea they were made by hand. And everything has to be perfect; if it’s not it has to be redone. And so many different tartans too! What also surprised me is that the people working the shops know which tartan is from what clan, even ones that are very similar. Impressive! After a morning of shopping, it was time for something more serious. We started by visiting Clava Cairns, a collection of stone structures used as burial sites way back in the day. The stone circles are build to match the light from the stolsis adding more meaning to the buriels and rituals that ever took place there. 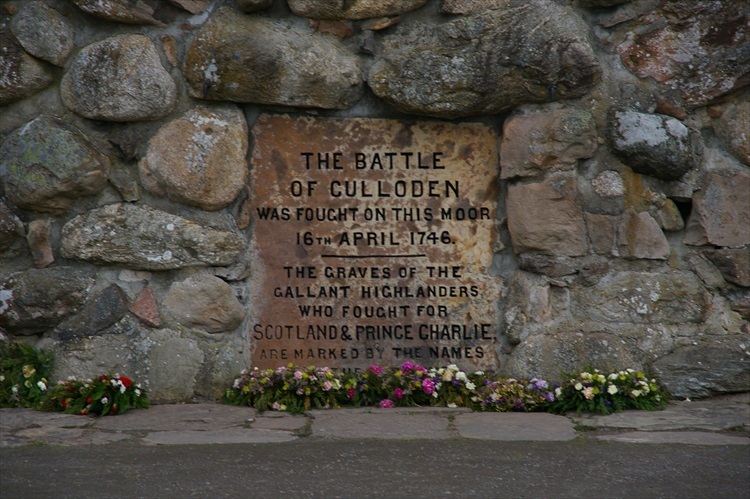 Our next stop was Culloden battlefield, which is near Inverness. It is now a site you can visit and see what happened there, learn about its tragic history. It wasn’t always as peaceful here as it is now. Back in 1746, on April 16 to be exact, a very defining and bloody battle took place between The Crown (‘the English’) and the Jacobites (‘the Scottish clans’). The Jacobites wanted to have another Stuart King on the throne but the English wouldn’t have it. Bonnie Prince Charlie let the Jacobites into this devastating battle, which would end in great defeat for the Jacobites that day, and to the banning of tartans and kilts (until the English Queen decided she loved tartans and allowed it again). You can also visit the graves of all the fallen Jacobites buried in mass graves arranged by clan. It’s a very surreal feeling to stand on the grounds once drenched with blood of those who fought for their cause. Because it is such a big part of the Highlands history it really is a must visit of you’re ever there. Another long and exciting day awaits us, we’re going to see if Nessie is home; Loch Ness here we come! When we planned out this trip we thought the longest part of the journey would be driving from Aberdeen to Inverness. Our planner showed us it would be over 3,5 hours without stopping along the way. In reality this seems to be the shorted drive so far, even though we stopped a lot along the way! Going from Aberdeen back into the national park, taking the A96 to Inverness directing us past beautiful view points and cultural stops along the way on a drive they call ‘The Highlands Tourist Trail’. We decided Huntley would be our first stop and see about visiting Huntley Castle if we could find it. Getting there wasn’t a problem, it was finding the actual castle that was a little problematic (or maybe we should both get our eyes checked when we get home!). Following the road signs to Huntley Castle we arrived at a little road leading past schools under a pretty archway into a natural area right on the edge of town. We parked near a school to walk up the path to try and find the castle, but both decided to get the car and drive further up instead. Narrow roads, many directions to go and looking for a majestic castle to appear made us look in all directions only to find the end of the road near a beautiful river. Opting for river pictures instead now, since we hadn’t found the castle, we got out again and took some photos. We turn around and see… Huntley Castle right there! It had been right in front of our nose all this time and we didn’t see it! To add insult to injury; I even pointed out a bench to Noëlla near the castle saying ‘I’m sure we can get up there somehow’. The somehow would be to just buy a ticket at the visitors centre we driven right past! 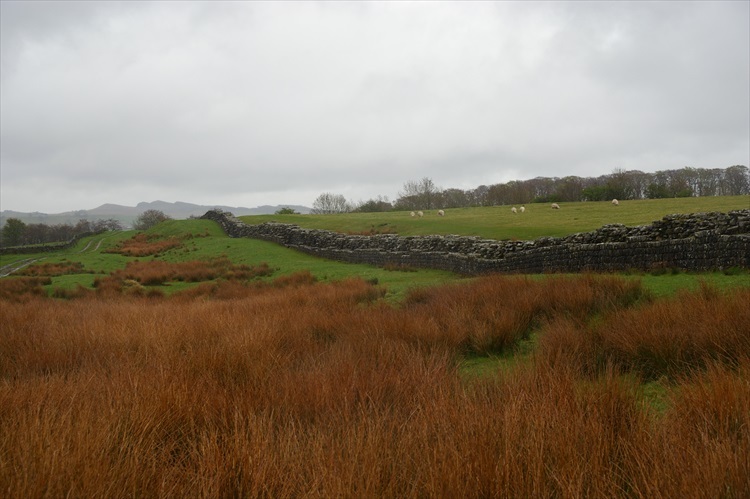 The other good thing about Huntley is we finally managed to get our explorer passes so we can get in for free at different sights that are part of Historic Scotland. 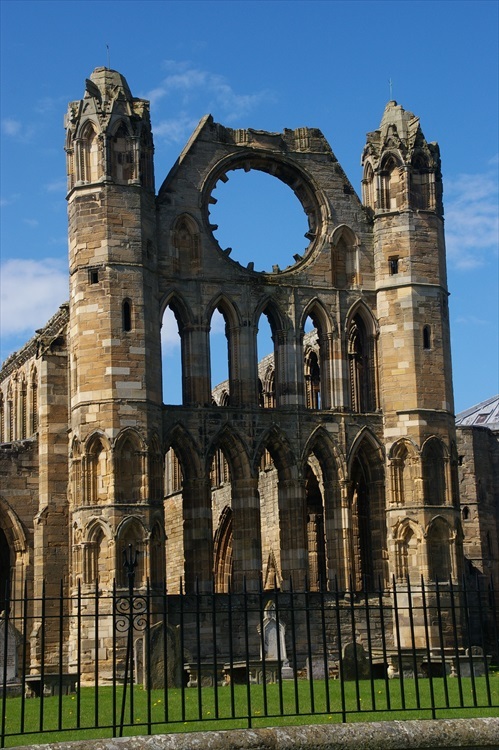 Next part of our plan was going up to Elgin to see the Elgin Cathedral, also a member of Historic Scotland. The Cathedral is impressive although it is in ruins now, since it’s been under attack more than once and they’ve tried to burn it down to the ground back in the old days. Unfortunately the cathedral shop and entrance were closed for lunch so we spend an hour waiting and eating our lunch on a nearby bench. Those who think Scotland only knows rain, I can tell you you’re wrong. It was a very sunny day and both of us got sunburned waiting for the cathedral to reopen. The lovely Alistair gave us some background information about the cathedral before we made our way onto the grounds. Walking along the ruins and the graves is a very strange feeling, knowing so many years ago this was a very important place in the community. They even put skulls and bones decorations, like pirates would, on their headstones back in the day! Heading out we thanked Alistair again for his time and went on to the last stop of our day before heading to the hotel in Inverness. Fort George. Fort George is still being used by the military, soldiers still reside and train there. It’s very big and right at the sea. Obviously we couldn’t go into all the buildings as some of it was off limits but walking around the parts that were open to the public cost us a few hours. After Fort George it was time to go to Inverness and find our hotel. It’s right near the city centre and very easy to find from the main roads. It’s more like a bed & breakfast and Wendy the hostess is a very friendly and helpful lady. The room is nicely decorated, fairly big and stocked up with supplies to make coffee, tea, hot chocolate and it even has cookies to go with it. This is the best place to stay we’ve encountered so far! Tonight we’re off to Hootananny for some live Scottish music and to try the infamous whiskey :). Tomorrow we’ll have an extra day to explore Inverness and the surrounding area before we have to head down to the borders again.